Étienne-Louis Boullée (February 12, 1728 – February 4, 1799) was a visionary French neoclassical architect whose work greatly influenced contemporary architects and is still influential today. Originally interested in painting, Boullée acquiesced to his father’s desires and took up architecture. He studied the mainstream French Classical architecture in the seventeenth and eighteenth century and the Neoclassicism that evolved after the mid-century. By the age of nineteen he had opened his own studio. Although few of his architectural designs were built, his theories and drawings enjoyed a large public following. He worked mostly as a theorist and a professor, teaching other important architects such as Jean Chalgrin, Alexandre Brongniart, and Jean-Nicolas-Louis Durand. His book Architecture, essai sur l'art ("Essay on the Art of Architecture”), arguing for an emotionally committed Neoclassicism, was only published in 1953. Étienne-Louis Boullée was born February 12, 1728, in Paris. He originally wanted to be a painter, but, following the wishes of his father, he turned to architecture. He studied under Jacques-François Blondel, Germain Boffrand and Jean-Laurent Le Geay, from whom he learned the mainstream French Classical architecture in the seventeenth and eighteenth century and the Neoclassicism that evolved after the mid-century. By the age of nineteen he had opened his own studio. He spent his entire life in Paris, working first as a painter and later as an architectural theorist. It was as a teacher and theorist at the École Nationale des Ponts et Chaussées between 1778 and 1788 that Boullée made his biggest impact, developing a distinctive abstract geometric style inspired by Classical forms. His work was characterized by the removal of all unnecessary ornamentation, inflating geometric forms to a huge scale and repeating elements such as columns in huge ranges. Boullée promoted the idea of making architecture expressive of its purpose, a doctrine termed architecture parlante ("talking architecture") by his detractors, which became an essential element in Beaux-Arts architectural training in the later nineteenth century. His style was most notably exemplified in his proposal for a cenotaph for the English scientist Isaac Newton, which would have taken the form of a sphere 150 m (500 ft) high, representing the universe, embedded in a circular base topped with cypress trees. Though the structure was never built, its design was engraved and circulated widely in professional circles. In the 1780s, Boullee, concentrating on his work as a teacher, scholar, and theoretician, wrote a treatise on his theories of art and architecture, illustrated with plans for public projects. The document was not published until 1953. Boullée sought to create architectural forms suggesting the sublimity, immensity, and awesomeness of the natural world, as well as the divine intelligence underlying its creation. He was also influenced by the contemporary enthusiasm for antiquity, especially for Egyptian monuments, prevalent in Europe at that time. Boullée abstracted the geometric forms suggested by ancient works of architecture into a new concept of monumental building that combined the calm, ideal beauty of classical architecture with considerable expressive power. In his famous essay, La Théorie des corps, Boullée investigated the properties of geometric forms and their effect on the senses, attributing “innate” symbolic qualities to the cube, pyramid, cylinder, and sphere, the last of which he regarded as an ideal form. To bring geometric forms to life, Boullée used striking and original effects of light and shadow. He also emphasized the potential for mystery in building, often burying part of a structure. His “poetic” approach to architecture made extensive use of symbolism. For example, his Palais Municipal rests on four pedestal-like guardhouses, to symbolize that society is supported by law. The “boiseries” (elaborately carved wooden panels) of the salon of the Hôtel de Tourolles, still often dated in the mid 1760s, were discussed in the issue of L'Avant-coureur for January 21, 1761, and so must have been carried out around 1758-59 (Eriksen 1974, 298 and pl. 35). The Hôtel in the Marais district, remodeled for Claude-Charles-Dominique Tourolle, survives (the rue d'Orléans is now the rue Charlot) but the salon's boiseries and chimneypieces were removed in the mid-nineteenth century to a house in the rue du Faubourg Saint-Honoré, now in the possession of the Cercle Interallié. Round-arched mirrors over the chimneypieces and centering the long wall in a shallow recess are disposed in a system of stop-fluted Ionic pilasters. White marble-draped caryatid figures support the chimneypiece's tablette. There is a full architrave under a dentiled cornice. The white-and-gold ensemble would still have been fully in style in 1790. The Hôtel Alexandre, or Hôtel Soult, rue de la Ville l'Évêque, Paris (1763-66), is the sole survivor of Boullée's residential work in Paris. It was built for the financier André-Claude-Nicolas Alexandre. In its cour d'honneur, four Corinthian columns embedded against a recess in the wall plane create an entry (now glazed). Flanking doors in the corners of the courtyard have isolated architraves embedded in the wall above their plain openings, while above, oval bull's-eye windows are draped with the swags of husks that became a common feature of the neoclassical manner. The garden front has a colossal order of pilasters raised on the high basement, occupied by the full height of the ground floor. Boullée's ideas had a major influence on his contemporaries, not least because of his role in teaching other important architects such as Jean Chalgrin, Alexandre Brongniart, and Jean-Nicolas-Louis Durand. Some of his work only saw the light of day in the twentieth century; his book Architecture, essai sur l'art ("Essay on the Art of Architecture”), arguing for an emotionally committed Neoclassicism, was only published in 1953. 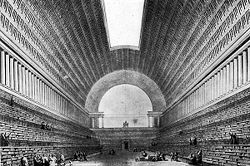 The volume contained his work from 1778 to 1788, which mostly comprised designs for public buildings on a wholly impractical grand scale. His emphasis on the psychological aspects of architecture and its impact on the viewer anticipated twentieth-century theories of architecture. Boullée's fondness for grandiose designs has caused him to be characterized as both a megalomaniac and a visionary. His focus on polarity (offsetting opposite design elements) and the use of light and shadow was highly innovative, and continues to influence architects to this day. He was "rediscovered" in the twentieth century and has influenced recent architects such as Aldo Rossi. ↑ Etienne-Louis Boullee, Gerat Buildings Online. Retrieved February 14, 2008. ↑ Etienne-louis Boullee (1728 - 1799), Artword Images. Retrieved February 14, 2008. ↑ From 1802 to 1818, the house passed to the marquis de Collonge, then to the maréchal Soult, whose name it now also sometimes bears. Boullée, Étienne-Louis (ed. ), and Helen Rosenau. Boullée's Treatise on Architecture. London: Alec Tiranti, Ltd., 1953. Curl, James Stevens. A Dictionary of Architecture. Oxford University Press, 1999. Eriksen, Svend. Early Neo-Classicism in France. London: Faber, 1974. "Boullée, Etienne-Louis (1728 - 1799)" in The Hutchinson Encyclopedia. Helicon, 2001. "Boullée, Etienne-Louis (1728 - 1799)" in Crystal Reference Encyclopedia. 2001. This page was last modified on 24 October 2016, at 16:53.